A late goal from Alexis Sanchez delivered Arsenal three points as they outdid a spirited performance by keeper Forster at the Emirates. The game got cracked open for the Wednesday night match. Flamini got the ball off Alexis, The Frenchman set up Welbeck who got there ahead of Forster, Welbeck shot, Wide. Pelle played one - two with Davis, Pelle struck well over. Oxlade Chamberlain took a shot, straight at Forster. Welbeck back heeled the ball, missed. Offside: Pelle got the ball, he missed. Offside anyway! The second round of the two middleweights got underway. Ramsey set up Cazorla. The shot was scooped wayward into the crowd. Sanchez placed the ball carefully to Giroud. The Frenchman knew how the ball had to be hit. Welbeck went for goal, Forster save Giroud got the leftovers, Save again. Giroud headed the Podolski ball. . . Forster made an amazing save, once again! 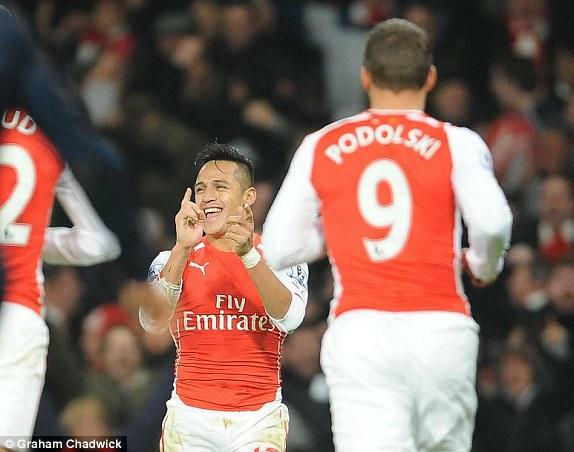 Goal for Arsenal, it was late, it was amazing, it was Alexis Sanchez. Who else? Fraser Forster got man of the match. Full Time. AFC 1 - 0 SOU. Arsenal win back - to - back, Southampton lose back - to - back! How long will this occur for both sides, in the unpredictable Barclays Premier League? A complete match report for Arsenal vs. Southampton contested in the Barclays Premier League on Wednesday 3 December 2014.